Do not use if there is any kidney disease present. Native to Europe and Asia, chickweed is now found in virtually all of the world. It grows easily in open areas and is generally regarded as a troublesome weed. It seems to thrive in areas where cultivation is common and in unattended gardens, but dwindles and becomes sparce where farming is abandoned. It is a sprawling perennial, growing to about six inches high and producing hairy stems, oval leaves, and star-like white flowers. 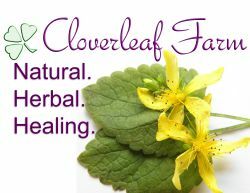 It is harvested throughout the growing season as a food and a medicine. In Gerard’s day (late 1500s), chickweed was given as a tonic to caged birds. A chronic weed to some, it has long been a valuable vegetable, as well as being used medicinally. 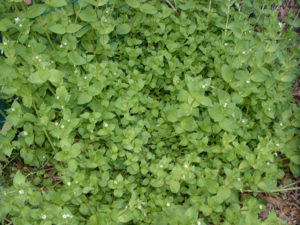 In the 1st century CE, Dioscorides, a Greek physician, wrote that chickweed could be used with cornmeal for eye inflammation and that the juice could be introduced into the ear for an earache. It was given as a tonic to malnourished children, reflecting its use in poor European rural areas as a “free food” in hard times. Decoctions of the fresh herb are used as a cleansing tonic, to relieve tiredness and debility, and for urinary tract infections. Tinctures are added to remedies for rheumatism. Poultices made from the fresh plant are applied to boils and abscesses and to painful rheumatic joints. Compresses are soaked in hot decoctions or in diluted tinctures and applied to painful joints. Creams are used for eczema and other skin irritations, including burns and scalds and to draw out insect stingers or splinters. Infused oil is made by the hot infusion method and applied as an alternative to creams for skin rashes, or added to a bathwater for eczema. Juice from the fresh plant is used either internally or externally to heal skin problems. Decoctions from the root are used for fevers related to weakness in chronic illness. Chickweed has long been used to heal wounds and in poultices for drawing boils. In China, the root is used as a cooling herb for fevers and to stop nosebleeds and heavy menstrual bleeding. The expressed liquid is used for soothing sores, and scaly or itchy patches of skin. It is said that two or three pounds of the fresh herb in a hot bath will tone and invigorate the skin. Because of its diuretic properties, chickweed is also good for certain kidney disorders; but caution is advised and should be done only under the guidance of a professional.